So far I am really appreciating my goals list. I always feel a sense of accomplishment when I finish a crochet project, but checking off items on my list is adding to that. I did really well for the month of March. I finished The Granny Square Project as planned and made my daughter a simple sweater to go with her Easter dress. But then I ran into a problem. When I finished the sweater and went searching for my thread to start my parasol, I realized that I had packed it away in my cedar chest, which we have moved into the garage of the new house. Not only that, but it has boxes and boxes of other stuff stacked on top of it. I thought seriously about just going and buying new thread, but I’ve got a lot of thread and I’m just not willing to buy more. So the parasol is just going to have to wait. Until when, I’m not exactly sure. In the mean time I’m just going to have to move forward with my list and come back later. So, I jumped ahead to my April Goals. I finished writing my boot cuff pattern and started writing the Boots the Monkey Pattern, however I am out of the yarn that I used to make that so I need go get some of that before I can continue. I feel like I am doing very well so far in my goals even though I haven’t been able to get the Parasol started. I should be able to get most of May’s goals done in April. 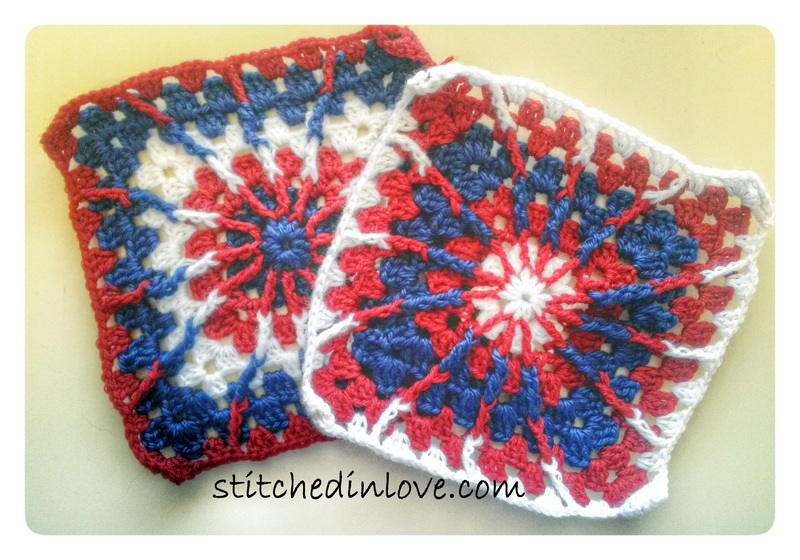 I have also added a few other projects and had a few custom orders to complete that I will write another post for. And here it is! 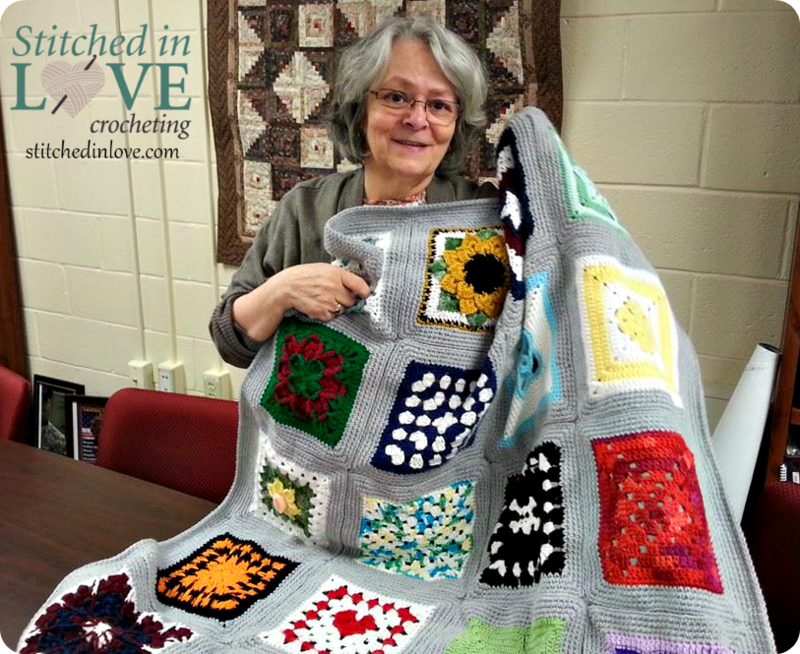 This is my Aunt Ruthie with her Granny Square Project afghan. 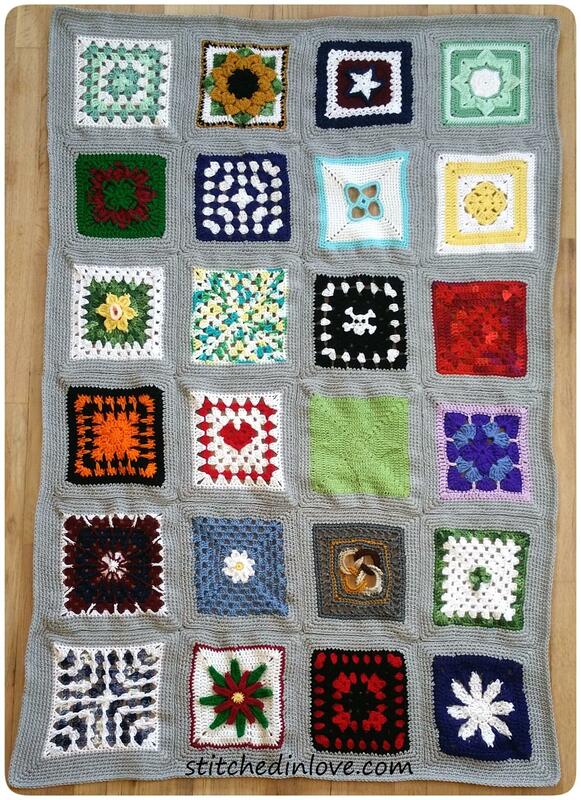 Ruth has made my family and I several quilts over the years including when my Husband and I were married and when our Daughter was born. She also tells me that she has a quilt on the machine right now for my son! 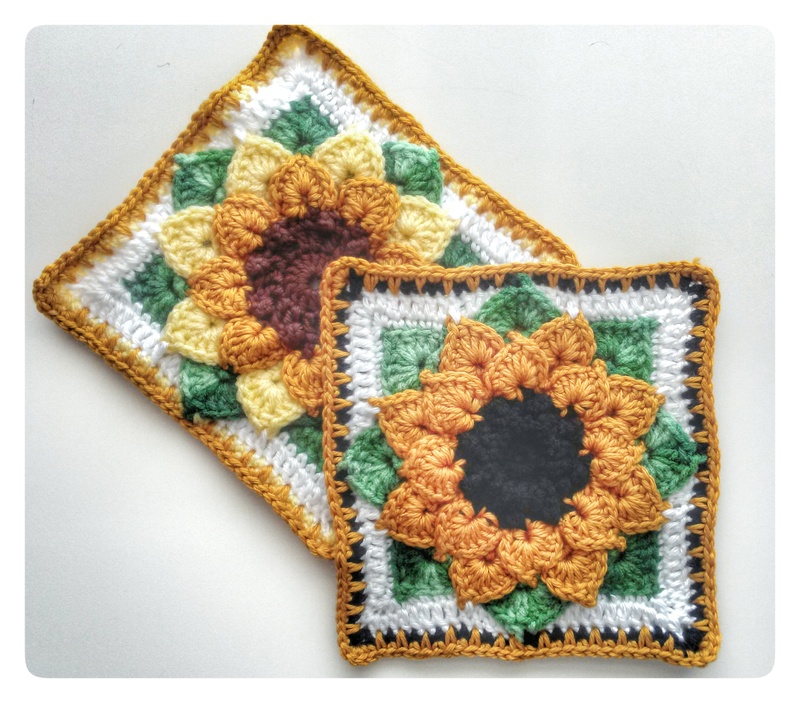 I wanted to send her something in return so she was the first person I thought of when deciding who to give the finished Granny Square Project to. I am so excited to be posting this. 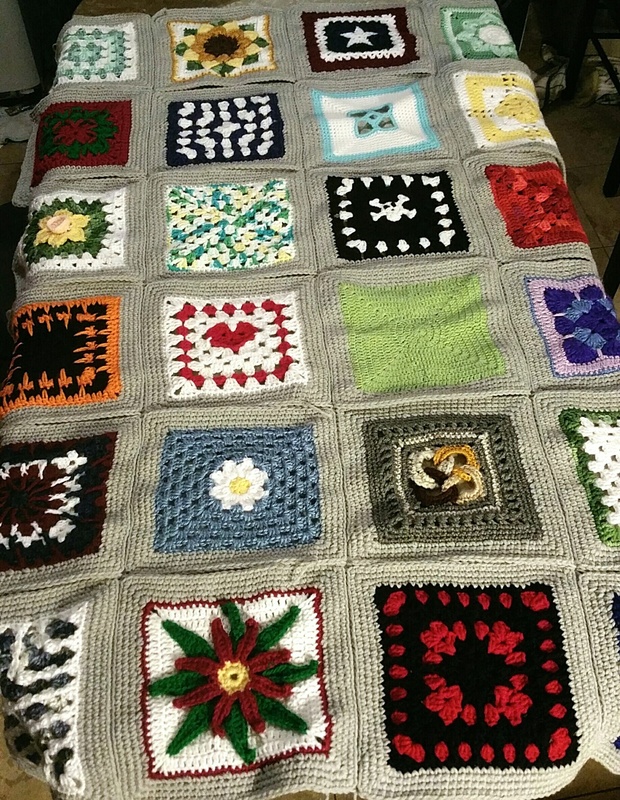 I have finished The Granny Square Project! I got the pictures I wanted of the final afghan taken today, and now it is all packaged up and ready to ship out tomorrow! Of course, when I was packing it up I realized that my tissue paper has been moved over to the new house. So I wrapped it up in an old doily instead and I ended up liking that more anyway. I can’t wait for the surprise recipient to get this! 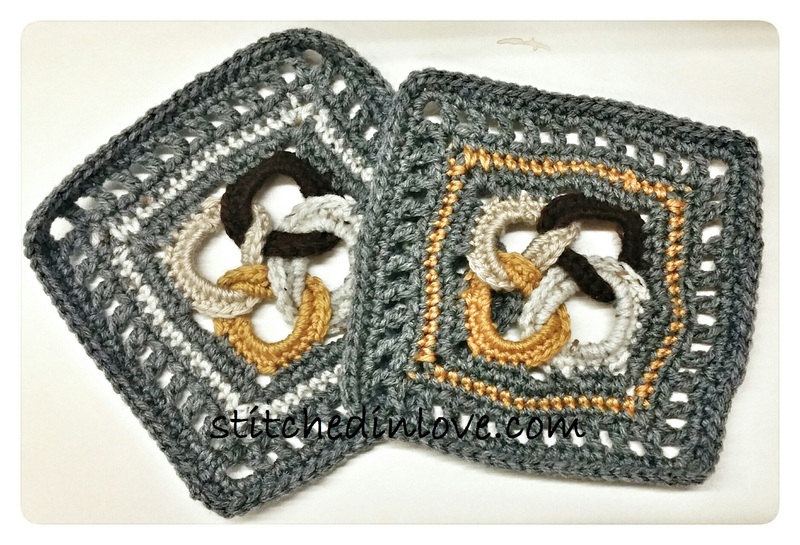 I have a twist to The Granny Square Project! 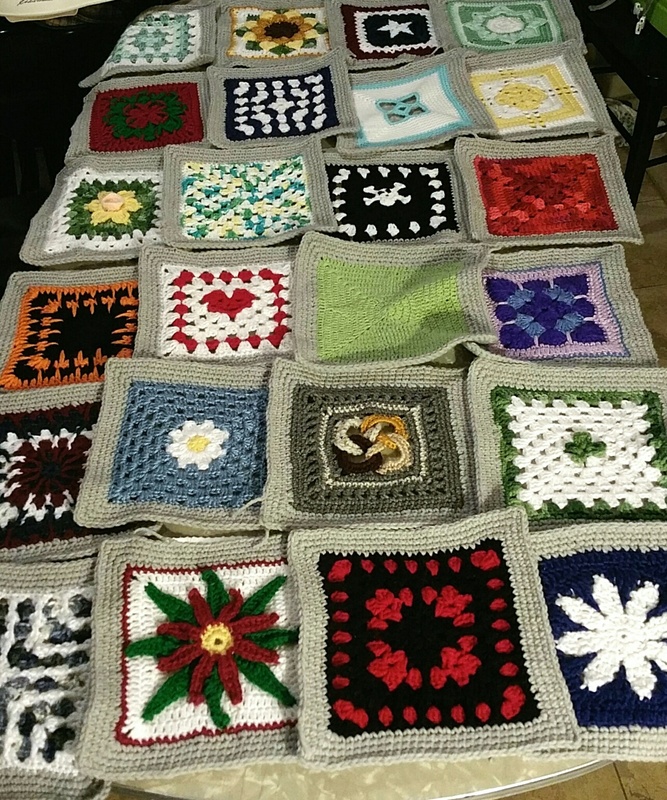 During the past year as I’ve been making the two squares for each month, I’ve actually been making four squares – two of each. 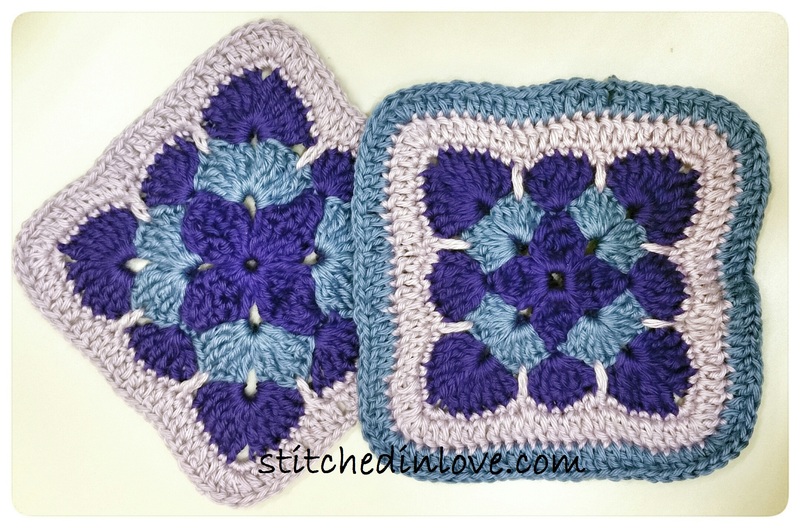 My initial plan was to make two separate afghans to give to two different people. But as I worked on it over the year I realized that I wanted to keep the second one for myself as a keepsake because I had made it during my son’s first year. So now I am blocking the squares for the second afghan. As soon as I’ve got them all joined and edged I’ll get a picture of them together and finish this project up! Most of the squares were exact duplicates. However, I made alternate squares for some of them by switching up colors or just the order that I used them in. I love the differences-some of them very subtle, others quite bold! I currently have 16 projects on my Evernote Crochet To-Do list. Sixteen! That doesn’t include all the things on my Crochet Ideas Pinterest Board that I would like to make. Many of the projects on my actual To-Do list are Christmas Presents for next year. Well, I guess I mean this year. I have several afghans that I want to make and several projects for my family, including finally making Christmas stockings and a tree skirt for us. I think I may also end up adding a few projects to my list once we get moved into our new house because with all the hardwood floors we have we are going to need some spectacular area rugs. Of course, I want to crochet them. I totally wish I could quit my job and just crochet full-time. I also have a few patterns that I would like to write up that I want to fit in there somewhere. 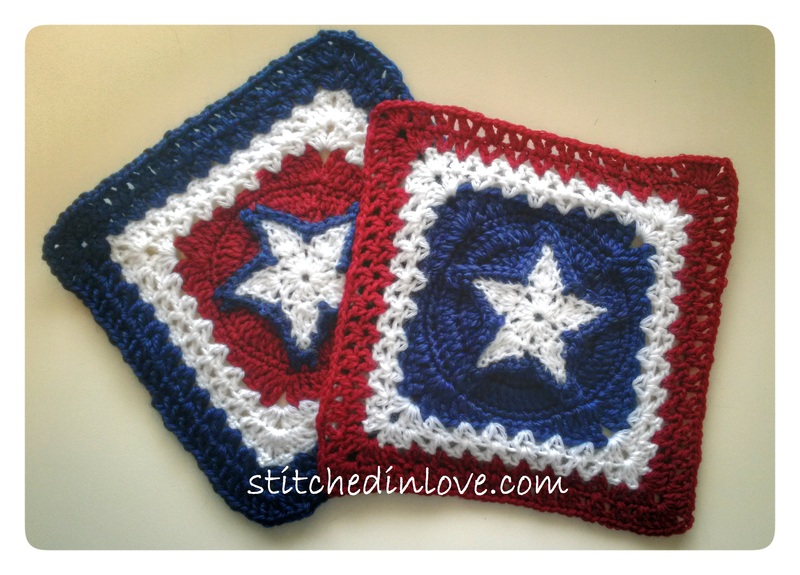 But with working full-time and two kids, and trying to do all the remodeling on the new house, my crochet time is limited. I had a little more time when I was still pumping milk for my son at work and could multitask by using that time to crochet. But that’s done and for the most part now I only get to crochet over lunch. Once the kids are in bed at night all I want to do is to fall into bed myself! So I’m going to join this link-up for goals and accountability. I’m going to go a step further though and tentatively plan out my projects for the rest of the year. The only thing is, I have no idea when I might receive an order for a finished product on Etsy so I’m going to have to go easy on myself. I think this plan is pretty ambitious. I’ve never really planned out what I intend to make for the year. I’ve always just had an idea in my head of the next few projects that I plan to do. I always feel like I’m trying to catch up with what I want to make! 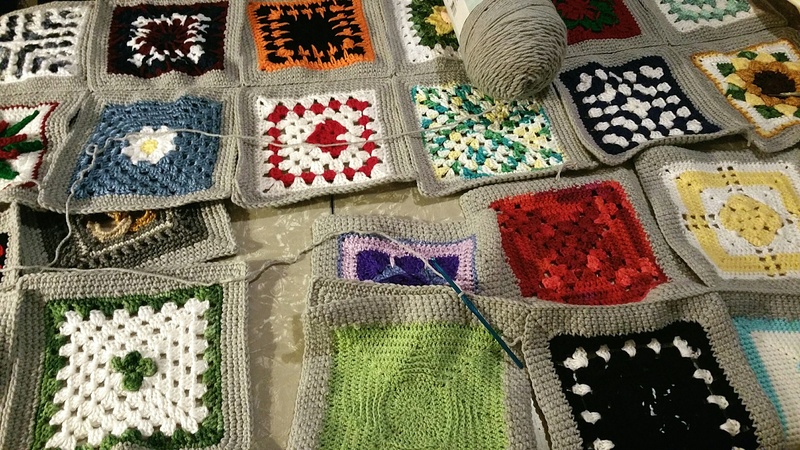 I got a lot done on the assembly for The Granny Square Project last night. First I laid all my squares out on the table in the planned 4×6 order and started swapping them around to determine placement. 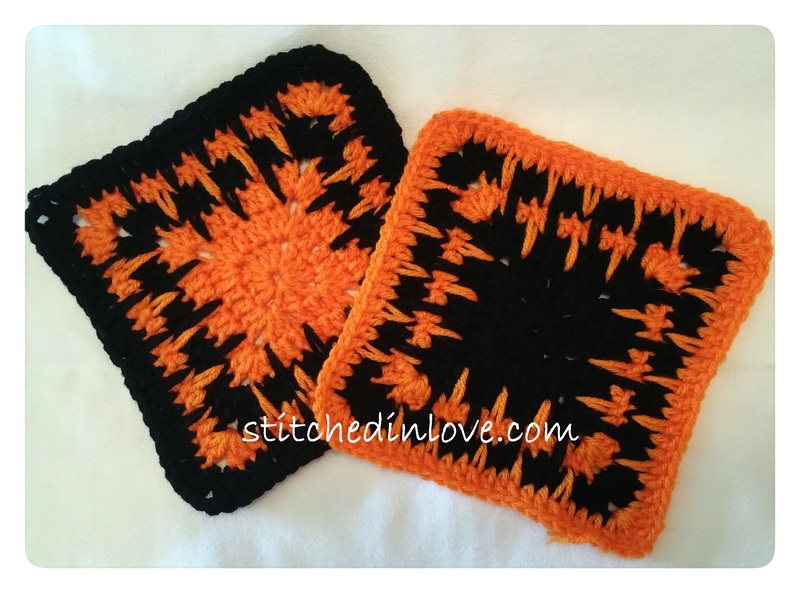 I didn’t want similar colors or squares with the same yarn too close to each other. I stood there moving squares for about 45 minutes and then asked my husband to come take a look and we made a few more adjustments. Then I started joining. I used the slip stitch method of joining on the wrong side in the two outside loops of the last round of the square. There is a good tutorial here for this and I really like how it looks on the front side. I’ll get a close-up of that tonight. I finished joining all of the vertical sides and tonight I’ll go back and do the horizontal edges. Then I’ll do a few rounds of single crochet edging to finish it out. I really do like the continuity the grey yarn has brought to the squares.